Choy Lee Fut was a surprise for me, because I have not heard so much about it before the first trailer released in February, and in June I finally got the notice from the company that DVD is out. Moreover it turned into more suprise because it looks like good old martial arts movies of 80-90s, especially it reminds me The Wheels on Meals movie, that movie where Jackie and Yuen fought western fighters (Keith Vitali and Benny Urquidez) in the streets of Rome. No, no, there is no place for such a popular topic West-vs-East, but this is a very good example of quality Hongkong action, which we have seen a lot in 90s. I really like Kane Kosugi, the son of the most known ninja Sho Kosugi, think he is undeservedly forgotten by Asian movie industry and rare second roles is not what he deserves. The Plot of this movie is simple: Choy Lee Fut revolves around two best friends in Europe (played by real-life best friends Sammy Hung and Kane Kosugi) who love martial arts. One organization decided to make some money, not so many, just 80 million. It decided to show the opposition of modern martial arts and authentic Kung Fu – Choy Lee Fut. They found the best school and as it always happens in such kind of movies sent there a few fighters for a test. Everything ends up at the Pan-American competitions, in the ring, not mat. While western fighters (2 Asian and 1 american) working out in a modern gym, Choy Lee Fut students train using old equipment, but students have teacher on their side, who do not want to help them (Why? Do not know), but he is always ready to tell some philosophical speech. He is not so useless, he brings 3 masters (Muay Thai, Tai Chi and some other Asian style), who aimed to teach students to protect from different styles of attack. Tai Chi looks really effective and I understand why the best bad guy Bolo Yeung practises it during all his life. 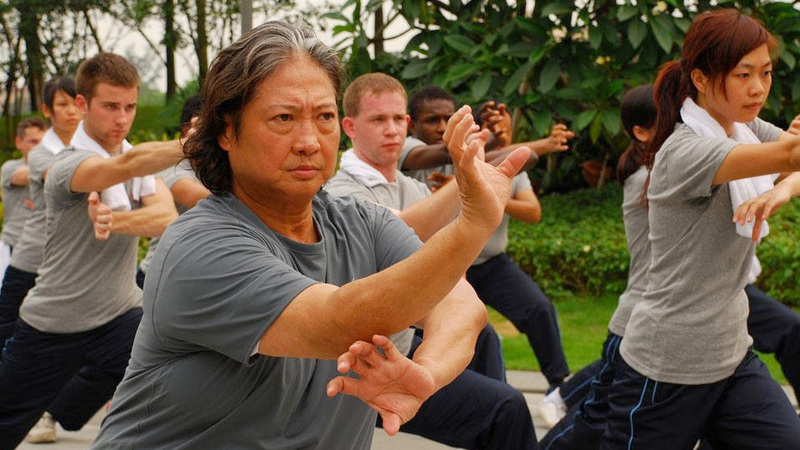 Sammo Hung got a small part playing the senior instructor of Choy Lee Fut style, travelling aroung the world openning and running schools. But if you see the name of Sammo Hung in titles outstanding fighting sequences are guaranteed. The second part of this movie reminded me The Best of The Best movie. Kane is a second guy in this movie, but only his fight looks tough, entertaining and qualified. The final fight between the youngest son of Sammo Hung (Tin Chiu Hung) and martial arts consultant of Pan-American Group (Dennis To) looks not so good, looses a rhythm few times in a row, probably because of all this fuss around the girl (you will got it when will see the movie). The fighting choreography has been made under supervision of Ming-Sing Wong, one of the former leaders of the famous Jackie Chan stunt team, now he is an action director in his own right. Since his days on JC’s team, he has choreographed many action films including the Japanese hit film “Muscle Heat” (with Kane Kosugi), HK dance piece “Give Me A Chance”, among other Chinese martial arts movies and TV series. Now he resides and works out of Beijing. One of the bad guys played by Ian Powers also known as Heng Li, he is a Beijing based American Actor. He has been working in asian films for the past 11 years. Of cause I could not mention Yuen Wah, who plays the Choy Lee Fut master. He is a Hong Kong based Chinese actor, martial artist and choreographer, who has appeared in over 160 films and over 20 television series. Will this style be so popular like Wing Chun I am not so sure, but clubs can expect some new students arrival. I really recommend you to watch this movie if you want to spent a good time enjoying tough fights, good cinematography and funny music.